It’s time for another Know Your Hook! For your reading pleasure, we’ll be look at hook sizes E through size 7 or, like we discussed in our last column, size G. These hooks are a bit smaller than those that pair with the light worsted weight yarns and measure from 3.5 – 4.5mm. In terms of yarn types, look for finer yarn than you have before. This fine yarn, categorized by a yarn weight of 2, is known as sport or baby type yarn. This is the type of yarn you would pull out when making something warm for a baby, like a warm baby blanket or any type of baby clothing. This is also the perfect yarn weight for lighter throws. Yarn of this weight is lighter than the average weight yarn, but is still perfectly suitable to be turned into a light and cozy throw. Just like with all the previous issues, since the hook size is getting smaller, so is the stitch size. 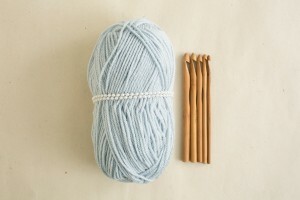 The yarn isn’t as thick so the stitches here will be smaller and your project will take longer to make. You most likely wouldn’t want to make a full-sized afghan with this type of yarn as it would take you quite a bit of time – and it wouldn’t be thick enough to keep you warm either. These hooks are getting a bit smaller, so they might not be best for beginners to work with. Once you have a grasp on the basic crochet techniques and aren’t fumbling with your hook, then you can start with this size range. 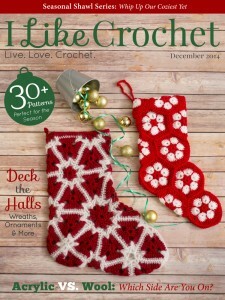 If you’re looking to work with even finer yarns, be sure to catch our next issues as we explore the smallest of the regular crochet range and then tackle the tiny steel hooks. Boyle sold hook sizers for both knitting and crochet – usually found in stores like woolworth, kMart and the older walmart stores – usually in general mdse stores in small towns. Also look in yard sales. When I use these smaller hooks and finer yarn I feel more refined and delicate and my crochet stitches show it in their refined and delicate look.